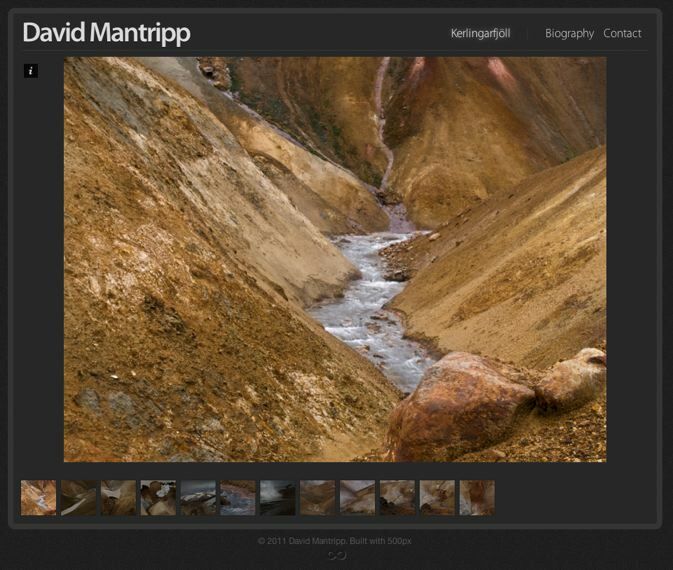 For quite a while I’ve wanted to try the 500px photo sharing site. I’m pretty bored with Flickr, although I’ve got some friends over there, because I don’t think it presents photos very well, it’s become very cluttered, and it is very, very focused on the now. I don’t think the date I took a particular photo has much bearing on what I set out to do. So I’ve gone back a bit and assembled a specific 12 photo portfolio looking at one specific place, Kerlingarfjöll in Iceland. All of the photos in this set were taken with “ancient” technology, the Olympus E-1, a camera limited to 5Mpx output. And they were taken before I’d really got a grip on digital, and generally the apertures are way beyond the diffraction limit. So they’re not going to be exhibition prints. But as an exercise in revisiting the past through a completely new portal, it’s quite interesting. Seems a little less trivial than Flickr, somehow, and more worth putting some effort into. Estimable pictures indeed, but almost impossible to view for this iMac user - takes an age to load each one from 500px. Think I’ll stick with the tried and tested flickr for now…. Ancient technology? That’ll be the OM1n you’re talking about. One day, I predict, everybody will be upgrading to one…. Kerlingarfjöll is one of the most scenic places on this planet. Check out my photos at http://www.arrajuoksa.com too.